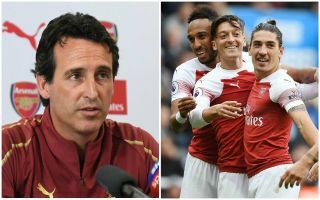 As Arsenal continue to impress without Mesut Ozil, Paul Merson has raised serious question marks over the German playmaker’s future with the Gunners. The 30-year-old has bagged four goals and an assist in 12 appearances so far this season, and it wasn’t so long ago that he was being praised for a dazzling display in Arsenal’s win over Leicester City. However, a month is a long time in football it seems as having failed to register a goal or assist since, while also being dropped to the bench against Bournemouth and left out of the squad at the weekend for the win over Tottenham with an injury issue, Ozil’s situation has deteriorated. There is an argument to suggest that he can still be very useful to Arsenal depending on the opposition and circumstances, but as noted in his comments below, Merson isn’t entirely convinced that Ozil fits into Unai Emery’s long-term plans. “I’m a big fan of Ozil but if Arsenal are going to play like they did against Spurs, work like that as a team and close down, you can’t have one not buying into it,” he told Sky Sports. Merson arguably makes a valid point, as Arsenal looked very impressive in their 4-2 win over Spurs on Sunday with a specific style of play and approach on and off the ball. With long-term criticism of Ozil’s lack of influence off the ball, perhaps Merson’s prediction could become reality as the longer the former German international spends out of the starting line-up and Arsenal impress without him, the more the exit rumours will surface and speculation will build.